Hemp is a well known vegan protein source and it's become increasingly popular due to it's high nutritional value. I've used hemp powder before and wasn't a fan of the earthy taste, but I've quite recently become quite obsessed with hemp seeds (I get mine from Linwoods). Hemp seeds are the seeds of the hemp plant...yes, the same species of plant as cannabis! They're incredibly rich in nutrients and are an amazing product to include in your diet. The seeds have a mild, slightly nutty flavour and are delicious but also very nutritious. But what exactly are their benefits? Hemp seeds are exceptionally rich in healthy fats and fibre. The essential fatty acids hemp seeds contain (omega-3 and omega-6) will keep your heart healthy and your brain in top condition! They also contain easily digestible fibre, vitamin E and iron! 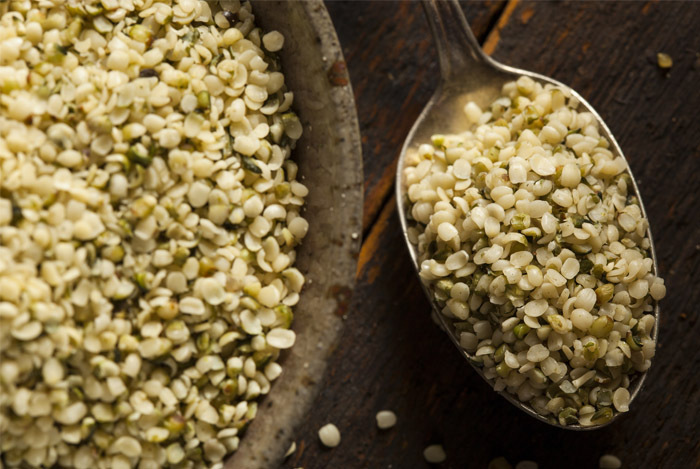 Around 25% of the calories in hemp seeds come from protein, which is relatively high for a plant-based food. Hemp is also classified as a complete protein source, which means it provides your body with all the 20 essential amino acids, including those that aren't produced by the body but are essential to include in your diet! These vegan protein sources aren't too common in the plant-world, but it's important to make sure you're consuming them for a healthy, happy body. The digestibility of this protein is also very good, better than that of nuts or beans. Hemp seeds are rich in both healthy fats and vitamin E, which are incredible for healthy hair, skin and nails. This goodness will help your hair feel stronger and look shinier, can even clear up problem skin and will prevent weak nails. There's even evidence to show hemp can be very beneficial to those suffering with eczema. Hemp hearts are good for human hearts! Hemp seeds contain high amounts of the amino acid arginine, which is used to produce nitric oxide in the body. Nitric oxide is a gas molecule that makes our blood vessels dilate and relax, leading to lowered blood pressure and a reduced risk of heart disease. Hemp seeds have also been shown to reduce inflammation in the body. Hemp seeds are incredibly healthy and truly are a superfood worthy of their reputation. Try adding them on top of your porridge or granola, with yogurt or even sprinkled on salads.